Stay on a boat for another way to stay. It’s something different and whether it’s your first time on board or your first time at a particular location you will often have questions. This is why bedsonboard.com has it’s own Message Centre where you can communicate with the owner in a secure and discreet way (we do not share your contact details until your booking is accepted). So before you sign up and start searching for your next trip, we’ve made things easier by sharing some of our top frequently asked questions on how to stay on a boat. Q. What’s special about staying on a boat? Q. Can I only stay on a boat in the UK? A. Our mission is to bethe world’s leading boat accommodation platform. We hundreds of boats in countries all around the world, with more joining our community each day. If you can’t find a boat in a location you want to visit then please let us know and be sure to sign up and become a member, so that we can inform you of our new listings. Q. Who would meet me when I arrive? A. In most cases this will be the owner. Once you have logged in to bedsonboard.com you can ask the owner any questions before you make a booking enquiry and continue the conversation through the Message Centre to confirm all the fine details. Q.What does it cost to stay on a boat? A.You’ll be surprised at how affordable it can be to stay on a boat instead of a hotel or B&B. Owners set their own pricing and so they vary depending what’s on offer and where but our most popular boats tend to be below £50 per person per night. Q. Is pricing flexible if there are only 2 of us sleeping on a boat? A. This depends on the owner but the price shown is for whatever is on offer, not per person. Boats are perfect accommodation for couples looking to escape for a weekend or take some time away to revitalise. Once you have signed up and become a member you are able to search for boats, find your perfect location and chat with the owner via our Message Centre. Q. Does it have a shower on board? A. Most of the boats will have showers. You should check the ‘Amenities’ section but also ask the owner using the ‘Contact Owner’ feature at bedsonboard.com. If not, there may be a shower on shore at the marina facilities but be sure to ask the owner. A. Usually, but don’t forget, you can always double check with the owner via our message centre on the platform. Q. Is there anything close by to eat and drink in the evening? A. The great aspect about Marina’s is that most of the time they are surrounded by lovely restaurants, bars and cafes. Staying on a boat will often give you a chance to experience local cuisine – don’t forget that you can ask the owner in the Message Centre for their recommendations and tips on where to go. Q. Can we go out on the boat as a day trip? A. No, it’s just for sleeping and relaxing. The Beds on Board platform is for accommodation services only. A. Boats are great when the sun is shining – you can sit back enjoy the fantastic surroundings, perhaps with your favourite drink whilst the sun sets. But should the weather turn, boats can also be very cosy and warm with many having TV’s, music and internet connections. Of course, you could use the weather as a perfect excuse to check out the local bars and restaurants. Q. Are there any restrictions for children staying on a boat? A. Boats can be great for kids and allow families to have their own space which can be costly in hotels and B&Bs. Safety should be the priority but any restrictions depends on the individual boat so please discuss this with the owner via the Message Centre. A. This would depend on the owner. Check whether the your boat is pet friendly by asking the owner via our message centre. Q. Do you take security deposits? A. We do make provision for Security deposits just in case there is damage done to the boat but no money is taken at the time of booking. Any security deposit will be handled later only in the event of a reported issue. Time for you to stay on a boat? In an earlier post we explained why we love to stay on a boat and we hope that this post has answered any questions you had. If you feel we’ve missed something or want to know anything else please do email us at questions@bedsonboard.com our team will be happy to help. 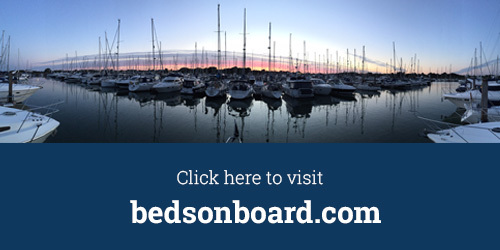 Be sure to visit our website bedsonboard.com, signup to become part of our community and start your search for alternative accommodation today.